Alina Digital's upcoming game challenges you to fight a war where direct conflict has disastrous results. As frightening as the Cold War was, it sure provided some great material for today's videogames. Forget about modern shooters; the real Cold War gave us proxy revolutions, the space race, and a golden age of espionage, all fascinating settings in their own right. Alina Digital, however, thinks it can encapsulate that entire experience into a single game, an RTS called The Cold War Era. Preorders are now being accepted and bundled with instant beta access, while all early buyers can suggest additional features for the final release. 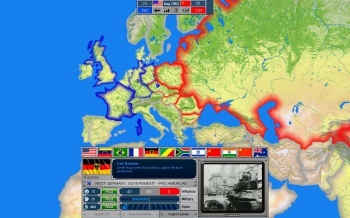 Cold War Era is a strategy game where players control American or Soviet forces from the 1950s onward. As in the actual Cold War, neither side wants to spark an all-out nuclear conflict, which would be devastating for everyone involved. Instead, players exert influence on the world stage, gaining allies and converting unfriendly nations until one political system remains. Strategies to this end include building elaborate spy networks, inventing new technologies, and starting (or stopping) revolutions that support specific ideologies. Preorders for The Cold War Era are available through a Kickstarter-esque donation plan complete with feature-based stretch goals and reward tiers. The reward tiers aren't offering many loot-based bonuses, save for a special edition release, but the highest donors can create ads for real-world companies to depict in-game. All early buyers, advertisers or otherwise, have the ability to suggest new gameplay features for the final release. Suggestions include everything from a "diplomatic" chat interface, to the influence-boosting Olympic Games, and more. Even without additional features, The Cold War Era seems to offer a unique take on RTS gameplay and the late 20th century setting, which alone could make it worth checking out. The Cold War Era's release date is yet to be revealed, but beta versions will be made available to all donors as progress continues.